NARITA, Japan (AP) — Japan has a reputation for loving expensive things like overpriced real estate, gourmet melons and luxury brands. But the nation is finally discovering the joy of flying cheap, with the arrival this year of three low-cost carriers. Flying is suddenly growing more casual, including for weekend dining, visits with friends, even day trips. Ticket prices are plunging by about half, to 16,000 yen ($200) trips to the southwestern resort island of Okinawa or a 5,000 yen ($60) hop to Seoul. 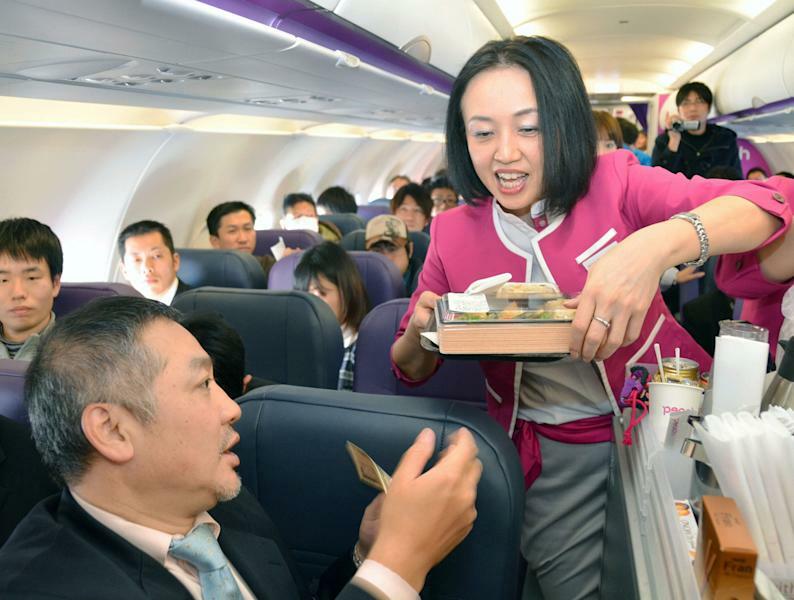 The airlines are not only out to woo Japanese away from regular leisure activities such as spending money at Disneyland or watching a movie. They are also out to convince the notoriously workaholic Japanese not to work so hard. They may revitalize Japan's 3 trillion yen ($38 billion) aviation market — already the world's third largest, comprising about 5.5 percent of global traffic and 11 percent of industry revenues — that critics say is untapped for its tremendous potential. Twenty-two-year-old graduate student Chie Kodama recently used Jetstar for an urban planning research trip to Okinawa, and was surprised at how the planes were "normal," like any other airline's. "And it is so cheap you forgive any shortcomings," she said. Booking early is a must for the best deals, and refunds and schedule changes aren't allowed. The gates are typically at the farthest end of airports. Flights are sometimes delayed. The wait feels longer because LCC users have to check in extra early. As he noted: What would be the point of having to pay hundreds of dollars for a cab home, if they had endured the cramped space of a low cost carrier to pinch pennies? "There was no way to cross your legs," Yamaguchi grumbled. "You wouldn't want to use it if you're going someplace far away." Still, the carriers are doing well so far. 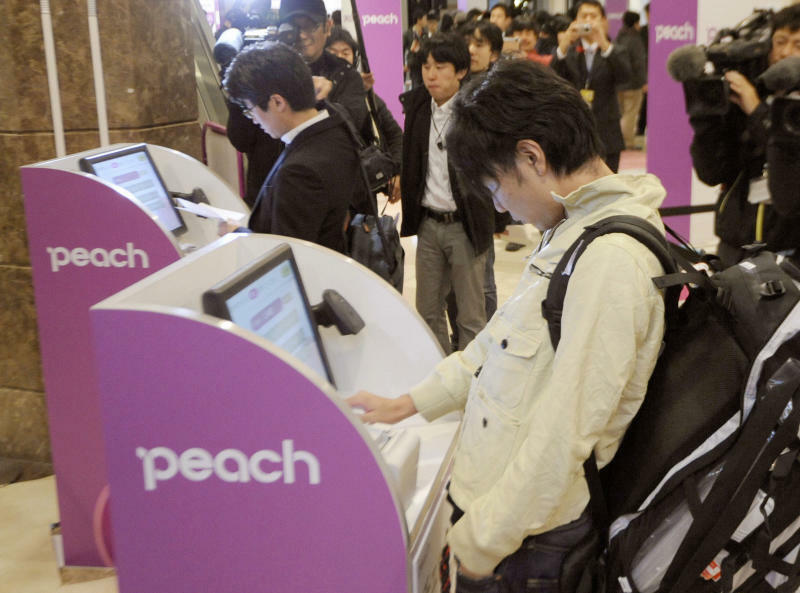 During the nation's Obon holidays in August, domestic flights at Peach were 94 percent filled, those at AirAsia were at 91 percent and at Jetstar, 89 percent. The companies are hoping to do as well for the year-end and New Year's holidays. "It's not that the meals on standard fares were ever free. The charge was just part of the ticket price," Kazuyuki Iwakata, president of AirAsia Japan, told The Associated Press. "With us, people pay only for what they need." During the go-go "bubble years" of the late 1980s and early 1990s, Japanese were especially seen as finicky consumers who delighted in 3,000 yen ($30) cups of fancy coffee and snatched up 500,000 yen ($5,000) designer bags. Such spending has lost some of its glamor as Japanese become less status-conscious, perhaps poorer and look for discounts. Such shifts in consumer tastes is underlined in the popularity, for instance, of Fast Retailing Co.'s no-nonsense Uniqlo clothing chain, which is also opening shops in the U.S.
Geoffrey Tudor, analyst with Japan Aviation Management Research, said low-cost carriers are introducing the fun of flying to young people and retirees. They are also popular with families who live apart to juggle work assignments and children's education needs — a practice so widespread a special phrase has been coined to describe it, "tanshin funin." "We aim to grow the piece of the pie," she told reporters recently. "People can travel more for less and have many more experiences." 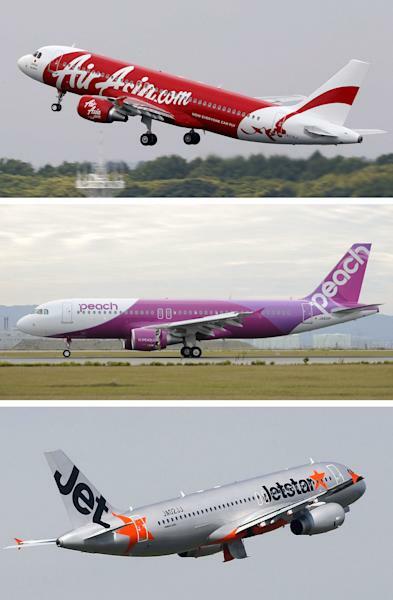 Jetstar Japan is a third owned by Australia's Qantas Airways Ltd., and a third owned by Japan Airlines Co., which is making a soaring comeback, thanks to a 350 billion yen ($4.5 billion) government bailout from bankruptcy two years ago and generous tax breaks that continue for several years. Mitsubishi Corp. and Century Tokyo Leasing Corp. are its other shareholders with 16.7 percent each. AirAsia Japan is 49 percent owned by AirAsia, a Malaysian low-cost carrier founded in 1993, whose motto is "Now everyone can fly," and 51 percent by All Nippon Airways Co., or ANA, JAL's rival. AirAsia Japan offers flights out of Narita, the Tokyo airport, to Sapporo, Fukuoka and Okinawa in Japan, and plans to start them to Seoul and Pusan in South Korea later this year. Flights to the Philippines and Guam are in the works as well. While expanding Haneda has given a boost to the airline travel market, officials say more needs to be done. Landing fees at Japanese airports are among the highest in the world, endangering Tokyo's role as an Asian hub. Tony Tyler, director and chief executive of the International Air Transport Association, said all carriers need to bring costs down if they hope to survive, but was upbeat about Japanese LCCs. "In many parts of the world, the low-fare sector has tapped into demand from new market sectors. So they have grown the market, rather than cannibalized it," he said. "They were surprised to see me and so happy," he said. "I hope the tickets keep getting even cheaper."